Snack A Round Tray 12 oz. 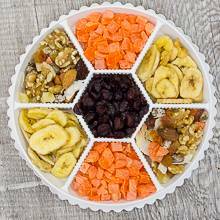 This round tray of dried fruits will make the perfect snack, hence the name. Included are dried diced papaya, banana chips, dried cranberries and our traditional casa trail mix. Enjoy!